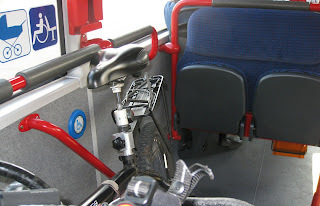 Last week I took my bike on the tram and bus to work . It was pouring with rain that morning but promising to be a sunny afternoon, ideal for a relaxing cycle ride home later. So I decided that the bike should come too. As the bike costs only ninety cents, the same as a child’s ticket, it works out cheaper to take the bike and then save and the fares back home. That is if it isn’t raining of course, which it wasn’t. I wrote a posting in April about the improvements to the transport system in Nürnberg which have been gradually taking effect over the last couple of years. 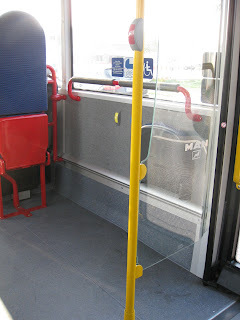 I mentioned that I had seen an advertisement for a new bus that now has space for two wheelchair-users. Or in my case a bike and a wheelchair-user, or a mother with a pram or pushchair. Last week, on the “rain before seven, sun before eleven” day, I travelled on one of these new buses for the first time. I placed my bike opposite the door as usual, but there was still space, diagonally opposite me, on the driver's side of the middle door, for a wheelchair. As it turned out it was a mother with a child in a buggy who later used the space. Having this extra space on a rainy morning was such a bonus, as I didn’t have to get out of the bus to make space, which would have resulted in a wasted fare and getting very wet. It is really important on this particular route for the new buses to be in action at last. There are many wheelchair-users at the centre where I work who like to travel into the city, especially on summer weekends when there is always a festival taking place. Usually they like to go with a friend, though until now they had to choose a friend who doesn't use a wheelchair. The introduction of these buses is doubly important because the cost of a taxi is prohibitive for most wheelchair users. The transport service for the disabled a little cheaper, but it stops running at midnight. That means being collected from the city at about 10.30 p.m. For youngsters who want to visit a disco this is unthinkable, at that time the fun is only just starting! Hopefully the “Nightliner” services, which run all night from the central railway station, will also be using one of the new buses.